On Saturday, July 7, His Grace Bishop Serapion, the Diocese clergy, and the community bid farewell to the late Father Angelos Youssef of blessed memory, who departed into the heavenly habitations on Saturday, June 30 after many years of faithful service. The day began with the celebration of the Divine Liturgy by His Grace surrounded by many diocesan clergy and deacons. Afterwards, His Grace presided over the funeral service, which was attended by substantially all of the Diocese clergy and over 500 parishioners. In his touching Eulogy, His Grace Bishop Serapion reflected on Father Angelos’s virtues and faithful service for over 15 years. He noted that Father Angelos’s name, which means “angel,” was a reflection of his personality and character throughout his life. In addition to his angelic character, His Grace reflected on Father Angelos’s faithfulness throughout his years of service in different capacities and how he was beloved by all who met him. 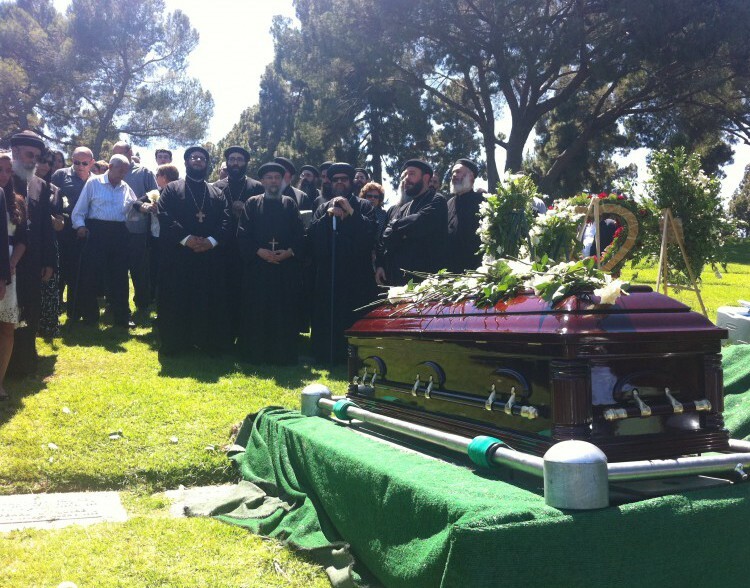 After the funeral service, His Grace, the clergy, and many parishioners bade farewell to Father Angelos during the burial service at Forest Lawn Glendale, where pure body is interred. May the Lord our God, the God of the Living, repose his soul in the Paradise of Joy, and may he pray for us with the choir of the twenty-four presbyters standing before the Throne of God.